"CHEAT-OHS" ice cream exists for a limited time at Big Gay Ice Cream. For many, Cheetos are a favorite snack. Those cheese-flavored puffs are just so good. There is a drawback to eating them, however, and we're not talking about the calories. Unless you eat your Cheetos with a chopstick, you're going to end up with sticky, neon orange dust all over your hands. If that's a pet peeve of yours – and you're an adventurous eater – consider Big Gay Ice Cream's newest flavor. Through Presidents' Day, the eatery will sell "CHEAT-OHS" soft serve. 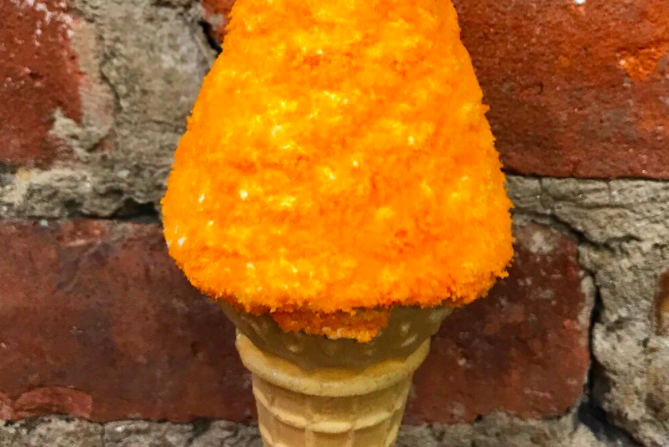 Yup, that's Cheetos-flavored ice cream. CHEAT-OHS is probably one of the more disturbing flavors we’ve ever done. I hate how much I love it.